A Sustainable Living Hub Seminar includes a visit to the OHIO Student Farm with Dr. Theresa Moran on Tuesday, April 16, at 5 p.m. in the Baker Front Room. Moran is leading an initiative to advance OHIO’s institutional procurement of regional food and, on a parallel track, advance the OHIO Student Farm as a site of interdisciplinary and experiential learning. The seminar will begin in the Front Room at 5 p.m. with a brief introduction to the Sustainable Living Hub, then it will continue at the OHIO Student Farm. Transportation will be provided from, and will return to, Baker Center. Moran’s procurement initiative evolves out of her partnership with Community Food Initiatives and Rural Action on the Initiative for Appalachian Food and Culture project, funded by the Sugar Bush Foundation. She established the Farm to OHIO Working Group to map out steps and hurdles for regional food producers to sell to OHIO; to develop a procurement toolkit for small producers; and to refine the definition of “local” purchasing to focus on the Buckeye Hills-Hocking Valley Regional Development District as defined by the Appalachian Regional Commission. Associate Vice President for Auxiliaries, Gwyn Scott, with senior staff are key institutional members of the working group. Moran’s Sustainable Living Hub Seminar was featured in the Ohio Ag Connection. Moran’s seminar will engage attendees in a “Know Your Local Food System” icebreaker with seedlings and coffee coupon giveaways while sharing local food knowledge. Moran, director of OHIO’s Food Studies theme, will talk about the OHIO Student Farm and how food is critical to sustainable living, not just on campus during college but throughout our lives and across the globe. After an introduction to her initiatives, Moran will lead seminar participants on a fieldtrip to and from the OHIO Student Farm, located on West State Street. Transportation will be provided. Join the group in walking through the hobbit door to the Circle Garden to see where students learn sustainable farming. Community Food Initiatives will be on hand to give a pop-up workshop on porch planting — pick up tips on how to transform your porch, deck or backyard into your own personal source for fresh, tasty produce. And it was featured in Compass. Participants will then take a tour of the Student Farm, the production site where Food Studies interns grow vegetables and fruit – come and meet your student farmers. Wander through the high tunnel where “season creation” comes to life and seedlings enjoy protection all year long. Snack on tender greens and learn more about how you can be part of solving healthy food access on campus and in our region. 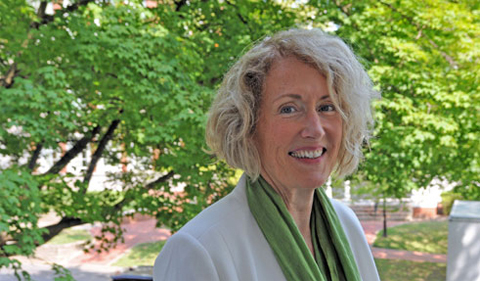 As one of three new faculty coordinators working with OHIO’s new sustainability structure, Moran’s Sustainable Living Hub will focus on sustainability initiatives connected to the themes of food, grounds, transportation and student affairs. Moran is currently leading an initiative to advance OHIO’s institutional procurement of regional food and, on a parallel track, advance the OHIO Student Farm as a site of interdisciplinary, experiential learning. Moran’s procurement initiative evolves out of her partnership with Community Food Initiatives and Rural Action on the Initiative for Appalachian Food and Culture project, funded by the Sugar Bush Foundation.